A Summary of the Basics. What is Audio Transcription? Audio Transcription is the practise of converting audio files to typed text. Audio File types include.wav,.mp3,.mp4. 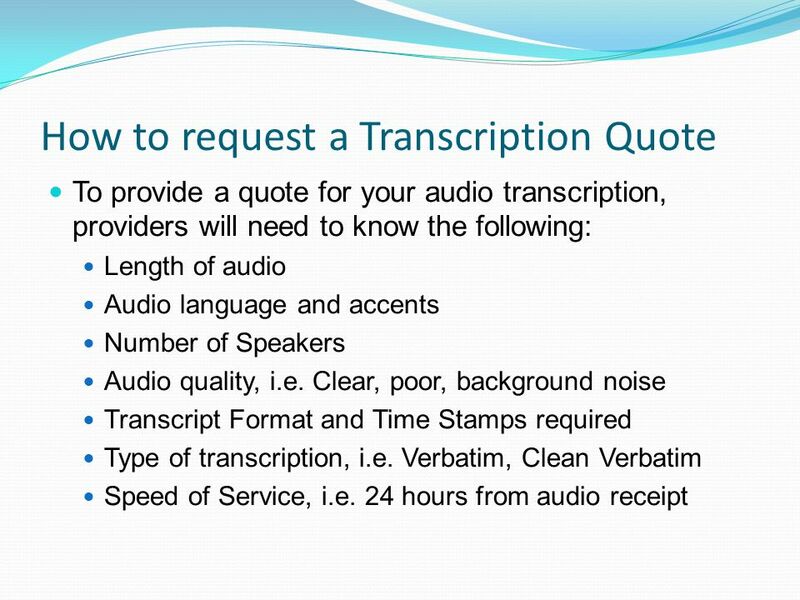 2 What is Audio Transcription? 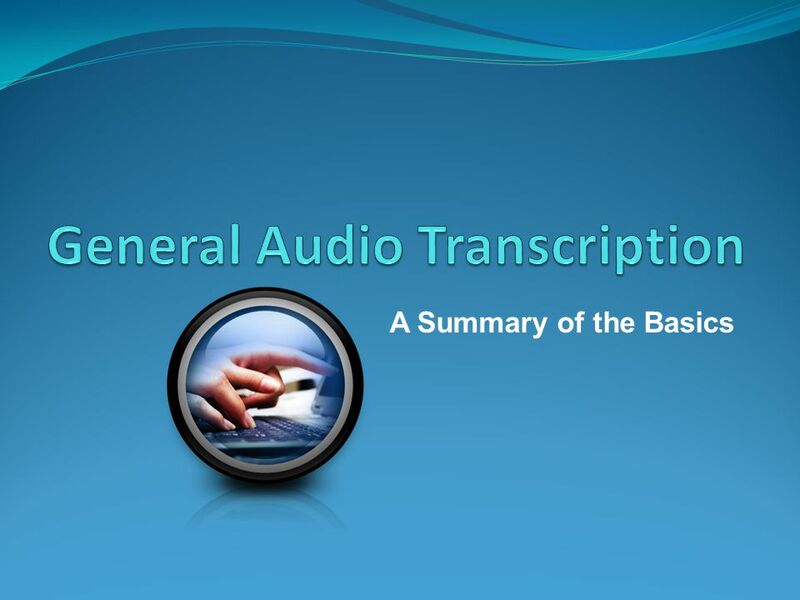 Audio Transcription is the practise of converting audio files to typed text. Audio File types include.wav,.mp3,.mp4 and others. 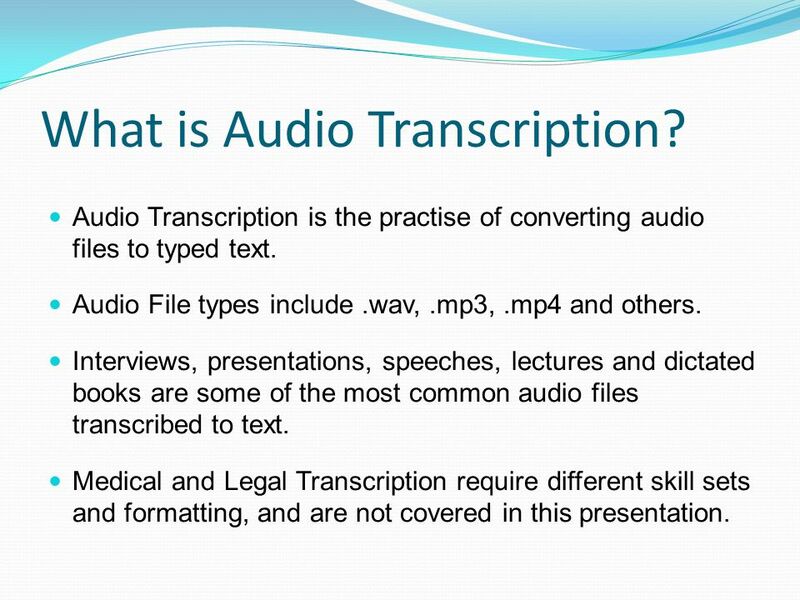 Interviews, presentations, speeches, lectures and dictated books are some of the most common audio files transcribed to text. Medical and Legal Transcription require different skill sets and formatting, and are not covered in this presentation. 3 How is Transcription done? Transcriptionists use software to start, stop and slow the audio speed as they type. 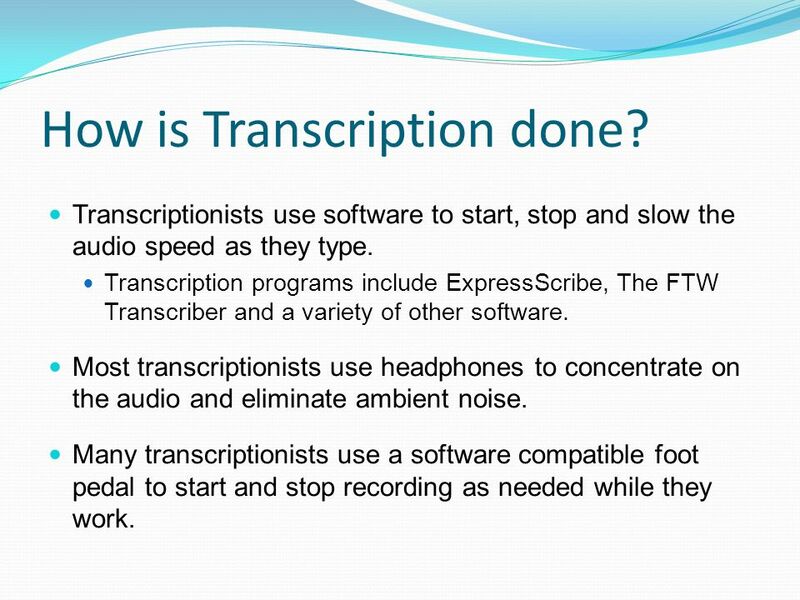 Transcription programs include ExpressScribe, The FTW Transcriber and a variety of other software. Most transcriptionists use headphones to concentrate on the audio and eliminate ambient noise. Many transcriptionists use a software compatible foot pedal to start and stop recording as needed while they work. 4 What does a transcript look like? Most transcripts are delivered in MS Word documents. 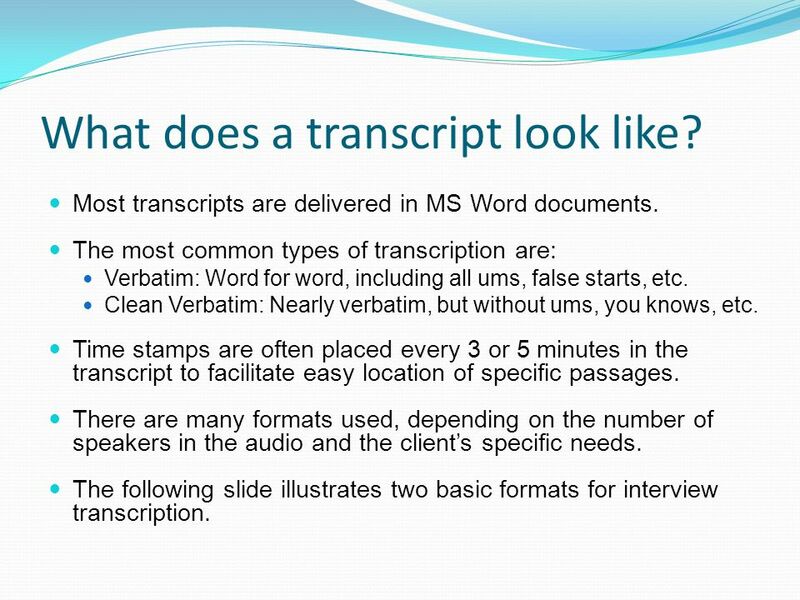 The most common types of transcription are: Verbatim: Word for word, including all ums, false starts, etc. Clean Verbatim: Nearly verbatim, but without ums, you knows, etc. Time stamps are often placed every 3 or 5 minutes in the transcript to facilitate easy location of specific passages. There are many formats used, depending on the number of speakers in the audio and the client’s specific needs. 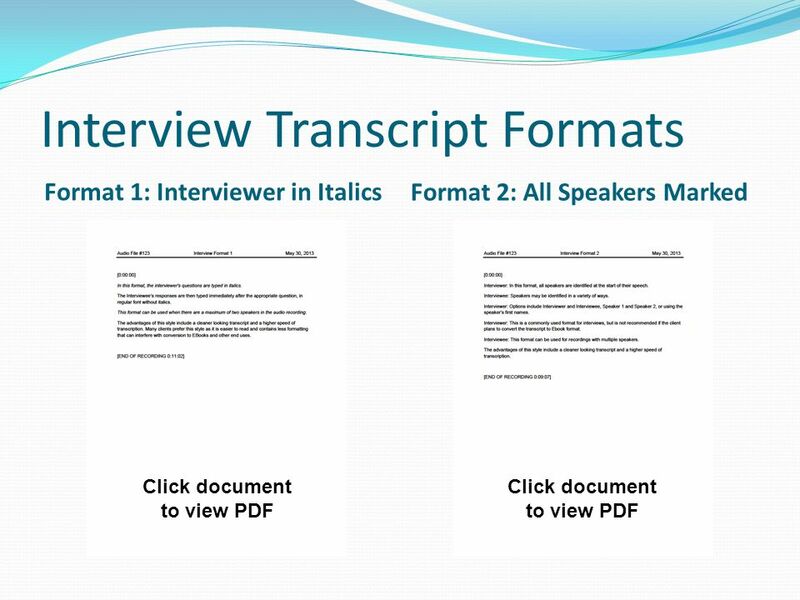 The following slide illustrates two basic formats for interview transcription. Download ppt "A Summary of the Basics. What is Audio Transcription? Audio Transcription is the practise of converting audio files to typed text. Audio File types include.wav,.mp3,.mp4." Making the Best Record Sponsored by the National Court Reporters Foundation Sponsored by the National Court Reporters Foundation Sponsored by the National. CREATING AUDIO FILES TO START AUTOMATICALLY WITH EACH SLIDE TEAM MARTHA-DAVID NOVEMBER 16, 2011. Using Audacity Audacity is a free, easy-to- use audio editor and recorder for a variety of operating systems. 3.6 Multimedia/Digital Media Components (Audio and Video) by Francisco Oliveira. MACHINE TRANSCRIPTION & DICTATION 6E. What Is on the CD?  Letterhead for each document  Audio file for each document  Evaluation forms  One for use. 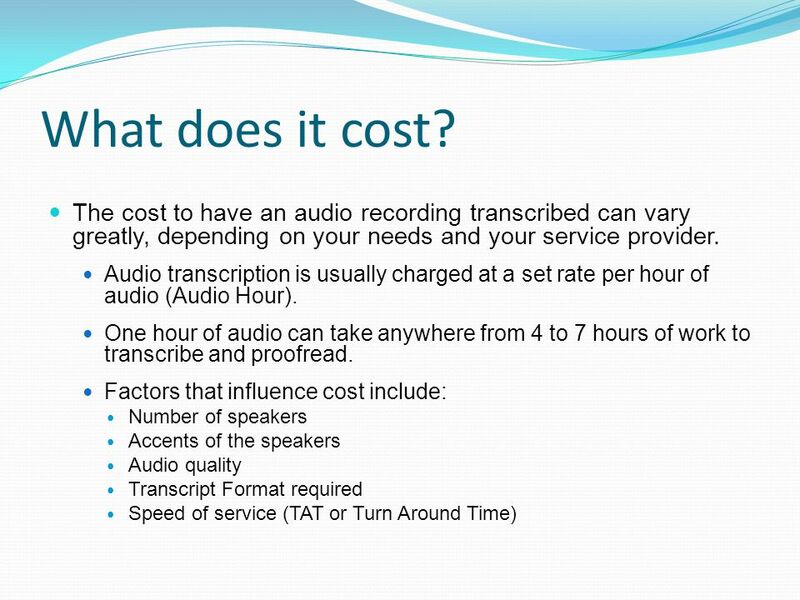 Transcription service.  Established in 2007 and providing software development and services for the past four years.  A leader among medical transcription. Course.com Transcription-Course.com Welcome to the only Free Online Transcription Course Available. Alphabetic Filing Procedures OT 122 Chapter Three. Title Subtitle. American Institute of CPAs Speaker Biography. PowerPoint, Live Text and Podcasting!. PowerPoint This presentation will show you how to add narration to a PowerPoint. Before you begin, please have. Oral Presentation Advice on Talk Outline Converted to PPT a text document by Mark Hill, UW- Madison. Recording Meetings with the CMU Meeting Recorder Architecture Satanjeev Banerjee, et al. School of Computer Science Carnegie Mellon University. Issues effecting the deployment of e-learning materials. Brian Mulligan Institute of Technology Sligo. 1 Coding Automation Tool Coding Automation Tool (CAT) extracts text from any medical document. Immediately converts text into billing-ready format (with.